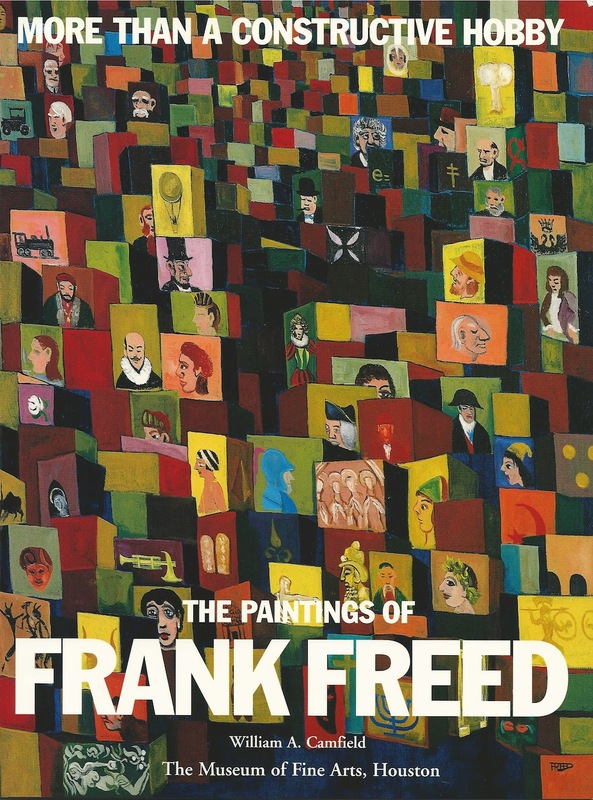 The Museum of Fine Arts book store is having a very nice little sale right now, and I got More Than a Constructive Hobby: The Paintings of Frank Freed an exhibition catalog from 1996 for an unbeatable $2. Frank Freed was an amateur painter in Houston who started painting at age 42 in 1948. He was heavily involved in the local Houston art scene in the 50s and 60s, particularly with the Contemporary Arts Association (later the CAMH) in its early days. 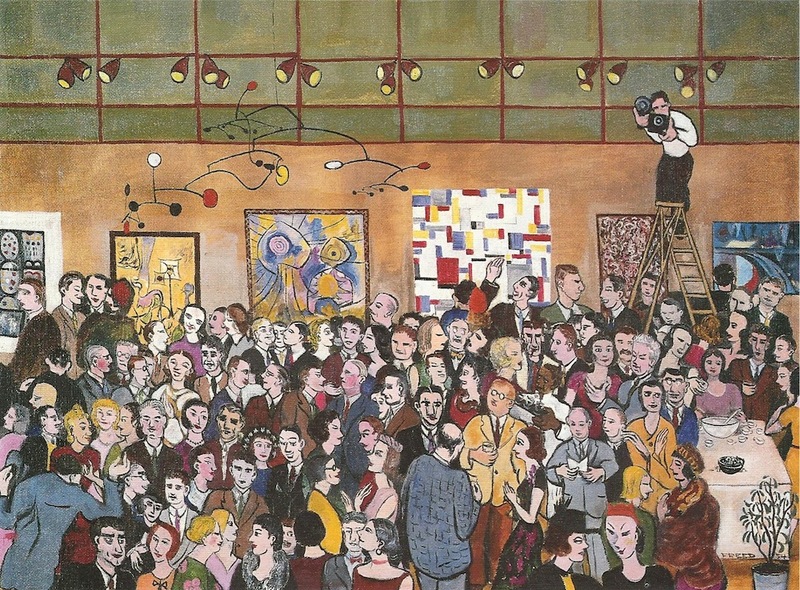 Probably his best known painting is Opening Night at the Contemporary Arts Museum from 1954. He had a upper-middle-class day job in the insurance industry (interesting that so many 20th century artistic figures, like Charles Ives and Wallace Stevens, had high-paying jobs in the insurance industry--not that Freed is anywhere close to Ives or Stevens in artistic stature). He was therefore a very active "Sunday painter." The title of the exhibit comes from a letter he sent to his future wife, Eleanor, when he started taking classes at the Museum of Fine Arts school: "It's high time ... I set up a couple of constructive hobbies for old age." Curator William Camfield thinks Freed was underselling himself, but this seems right to me. He never quit his job and never seriously pursued a career as an artist. It was a highly engaging hobby. As someone who has a decent paying professional day job and an all-absorbing hobby on the side--this blog--I can relate. Freed's paintings are a mixed bag. Even though he had a couple of classes with serious teachers, his work is fundamentally naive. You couldn't call him an outsider artist, but you'd be forgiven if you thought of, say, the Rev. Howard Finster when you saw his work. 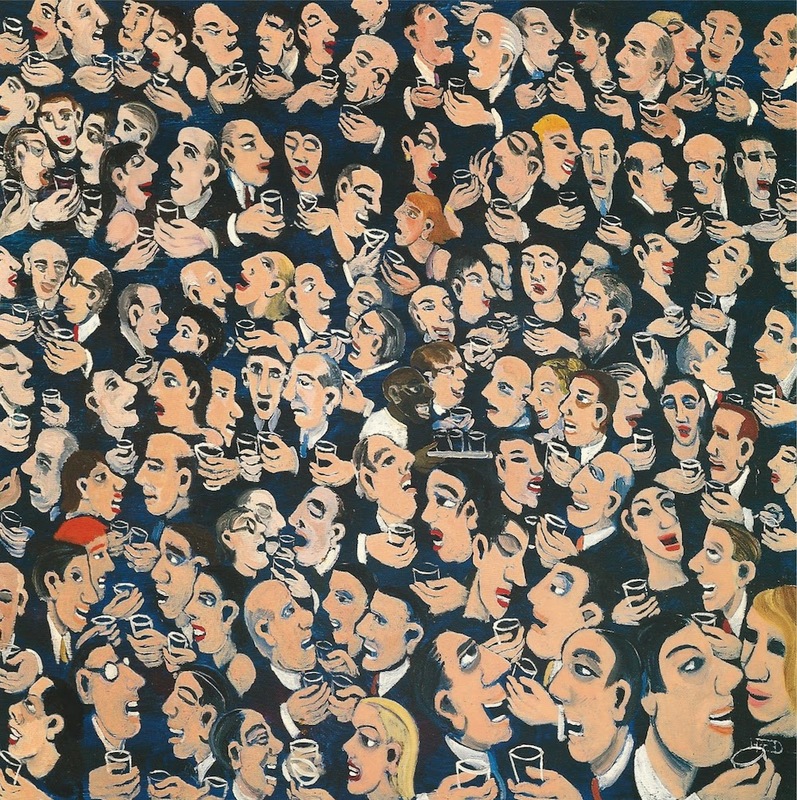 However, his most obvious influence was Ben Shahn, whose work apparently "floored" him when he saw it in New York in 1947. 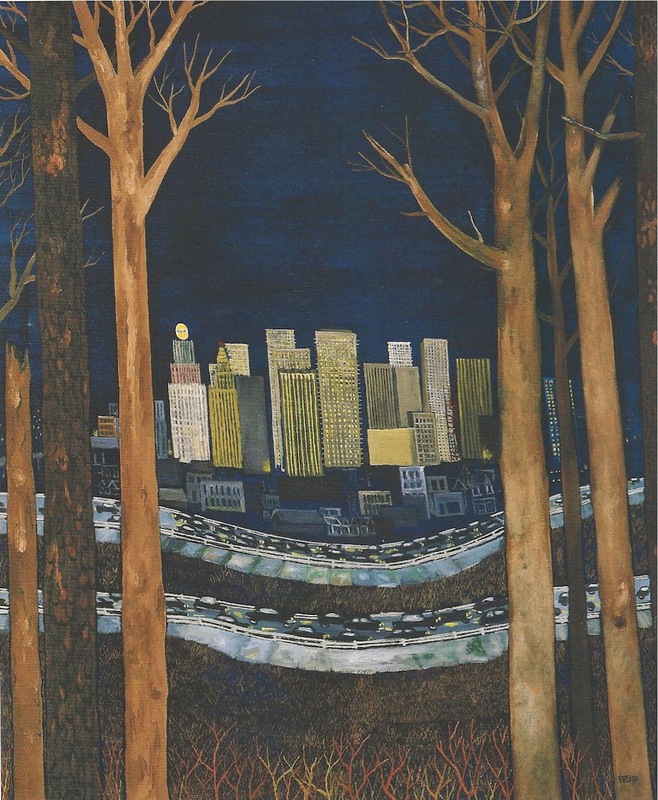 His first painting class was with pioneering Houston modernist Robert Preusser. His subject matter was his life, his city, his World War II experiences, Jewish life and his travels. Many of his subjects reflect his middle-class lifestyle. Often he deals with political subjects overtly, but occasionally he sneaks it in, as in Cocktail Party which depicts what may have been a typical Houston cocktail party in 1963--all white except for one black face in the middle, the waiter. It's reasonable to ask if Freed was deserving of a solo exhibit at the Museum of Fine Arts. He was not by any stretch of the imagination a major Houston artist. But what makes him worth examining is that he was an important figure in the cultural life of Houston, and his painting was a part of that. This is made clear by the excellent critical biography written by William Camfield. He focuses tightly of Freed and his work, but by placing him and his activities in the context of his times, Camfield tells a kind of art history of Houston. Modernist and contemporary art was pushed forward here largely through the efforts of middle-class enthusiasts like Freed, especially in the days before the MFAH and the CAMH had full-time curators. When this show was reviewed by Sheila Dewan in the Houston Press in 1996, she asked, "Freed was basically a Sunday painter, of which there have been many in Houston's history. It's likely that more than a few of comparable talent have gone semi-professional, as Freed did before his death in 1975. So the question then is, why is the MFA paying homage to this particular one?" Her answer was cynical--money. Freed, over the course of his life, became moderately wealthy and his wife left a large bequest to the museum when she died. In a way, that can't be discounted. If Freed had been an upholsterer or a mailman, would anyone remember his work today? Well maybe--we still go to the Orange Show and the Beer Can House, after all. In fact, I think it may be harder for a wealthy art patron to be recognized as an artist than other people. Freed didn't have a solo exhibit until 1964. In the 50s, only family members and a few friends knew he painted. It was only because his wife Eleanor promoted his artwork that he started to get exhibits. And even when someone like Freed does start showing his work, it must be difficult for anyone to take it seriously. For an active art patron to proclaim himself an artist seems utterly dilettantish. In the end, we like Freed's work because it is likable, not because he was rich. In any case, thanks to Camfield's catalog text, this exhibit wasn't just about one man's art--it was also about a period in Houston's history (including its art history). The MFAH had a lot of these catalogs left. And it's a great bargain for just two dollars. Get it while the sale is on. His wife Eleanor was the art critic for the Chronicle or Post ( I cannot remember) for many years. Back then art criticism in the paper was very much part of the cultural scene. Others such as Patricia Johnson, Susan Chadwick, Mimi Crosley offered their often hard hitting reviews of my work and others of my generation. No fluff crits. then. Her job placed the couple squarely in the art world, but it ended up being another obstacle for public acceptance of his work because Eleanor correctly felt like she could never write about Frank's work--it would be a conflict of interest.